It's ironic because Aki Kurose was considered - just several years back - to be a "failing" school but now is a "growth" school with a steady rise over several years in test scores. As well, they have falling discipline rates. And, their principal, Mia Williams, was just named Middle School Principal of the Year for Washington State. All these things that charters claim just aren't happening in public schools and yet, there you go. And think of what Ms. Williams and her staff could do with fully-funded education for the students at Aki Kurose. The Seattle School Board recently adopted a new bell time schedule for the upcoming 2016-17 school year. This change is meant to recognize and leverage research that has shown that teenagers may benefit from later start times resulting in more sleep, better health, increased academics and improved truancy rates. As the spring high-stakes, common core tests begin, the Opt Out Bus will be touring Seattle schools to provide families with information on their rights to opt out of standardized testing. Chris Reykdal is a native of Washington state and attended WSU. He serves as a representative in the legislature from the 22nd LD. He is the Vice-Chair of the House Education Committee. He was also the Deputy Executive Director for the State Board for Community and Technical Colleges. He and his wife, Kim, were both teachers earlier in their careers; she is still a high school counselor. Flip Herndon did not make the final cut for the Edmonds School District superintendent post. In 2013, he applied to be superintendent of Renton Schools. He had previously been the superintendent in Bremerton School District. Michael Tolley is in the final four to become the superintendent of Bainbridge Island School District. New Budget from Legislature Doesn't Address "Levy Cliff"
That increase in the levy lid is set to expire in January 2018, causing school district officials to seek an extension. Some lawmakers argued that school district officials won’t need the increased levy authority if the Legislature meets its obligations to fully fund public schools before 2018. The compromise budget says the Legislature will revisit the issue next April, if lawmakers determine they aren’t on track to fully fund public schools by April 30. Other lawmakers said school districts need more certainty than the budget provides. State Sen. Mark Mullet, D-Issaquah, said many school districts will have to plan for layoffs and budget cuts without the extension of the levy cliff. So, to review, there are legislators who believe in pushing, pushing right to the edge of time constraints to fulfill McCleary. What do I believe? I think there are those in the legislature who truly want to upend the public education system in this state and believe they can do it by not fulfilling Mccleary and continuing to expand ed reform like charter schools and vouchers. The new organization officially came out of stealth mode earlier this month, announcing plans to solve the region’s pressing transportation and education problems with the help of government, the University of Washington, and 17 leaders from some of the largest and most successful local companies. I'll be honest; when I see more business types than any other in a group, I always have my doubts. Update: the Governor's office has a list of bill signings this week. The charter school bill - 6194 - is not on it. A signal he might let it quietly pass into law? Who Was Propping Up Washington State Charter Schools After Supreme Court Ruling? I finally received one charter school's documents that I had requested via public disclosure; these were from Green Dot's Destiny Middle School. Green Dot itself only sent them to me in hard copy which, of course, makes it more difficult to copy from and track. They said they have to buy special "software" to send them to me electronically. Guess what was in the huge stack of documents? A letter dated October 2015 to a law firm saying that Green Dot would be sending them public disclosure documents...electronically. Here's the narrative I wrote about the time right after the September 4, 2015 Supreme Court ruling that struck down the charter school law to about the end of December. The narrative does have an Executive Summary but really, to get the full impact, you should read the entire narrative. Busy, frantic, scheming is how you would describe the actions of the charter schools in the e-mails, their supporters, OSPI, State Superintendent Randy Dorn and, most of all, the Washington State Charter Schools Association. The Seattle Special Education PTSA will hold a SECOND March meeting tonight at the JSCEE auditorium from 7-9pm. Our guests include SPS' new Manager of Behavioral Health David Lewis. We've asked him to talk about the district's implementation of its multi-tiered system of supports for social-emotional needs (MTSS-B). Hope to see you there. Please join us to offer your feedback on how Seattle Public Schools could best serve students under the state’s new high school graduation requirements. Phase 4 Which schools should be on the Opt In List? Phase 5 What are the district wide issues that need to be discussed, analyzed and mitigated to support school communities? Phase 6 What will a school based plan need to have discussed, analyzed and mitigated to support the school community? Phase 7 What additional districtwide support is necessary to ensure a successful bell time change? Phase 8. What implementation issues need to be addressed after plan is implemented? Page 19 of the Presentation then has the breakdown of how these phases should play out. The Task Force charter is on page 22. The Budget presentation is also meaty reading. Page 11 shows that PTA funding is now over 5% of grant funding and is more than combined corporate/other foundation funding. If you have questions or comments on the budget, you can write to budget@seattleschools.org. Operations Committee meeting from 4:30-6:30 pm. No agenda yet available. Councilman Rob Johnson and Soup for Teachers, University Temple United Methodist Church, 1415 NE 43rd St. from noon to 2:00pm. By my rough count, probably half of Seattle Schools' school buildings are probably pre-1986. That's a key date, according to this NY Times story on schools nationwide worrying about lead in the water. I am excited to announce Dedy Fauntleroy has been appointed as the new Planning Principal for Cedar Park Elementary School, starting this fall. She has been serving as Principal for John Stanford International School (JSIS) since February 2014. Sara Bernard at The Seattle Weekly is looking for parents willing to chat about why they are on the fence about opting out of standardized testing or if you have felt pressure from administrators about opting out. She is also looking for students & teachers willing to share their experiences with these tests. Update 2: Useful chart from Ed Week on how each state does its testing. Did you know that students in our district who opt out of standardized tests receive a zero rather than a more statistically accurate null score? Please join me in asking our board to make the change to a null score to increase the statistical accuracy of test scores in our district. Kudos to Director Rick Burke who Skyped into the Work Session on Wednesday from London. By the time he got on, it must have been about 1 am his time. Afternoon bus routes in Central District might be impacted by Sanders rally and Sakura-Con. Parents will be notified of major delays. Are you going to the Democratic caucuses? I am. It may be old school but it is one of the most truly democratic experiences you can ever have - talking to neighbors and others about who should sit in the White House. More on this in a separate thread as both Dems have pretty disappointing views on K-12 public education. I am putting back the ability to comment at will but with a couple of caveats because I am tired of a few people making work for me just to be unkind. One caveat is that I will let you know that CK did comment on one recent thread but I am declining to allow his/her comments any longer because of an tone that appeared to me and others as threatening. (And when CK saw a comment did not make it into a particular post, he/she used a quote from the Catcher in the Rye and called us all "morons.") I can't stop CK from posting but I will delete every single comment. Another caveat is that the other person who does immature things when he/she posts like swear or post the same thing multiple times or ask me where I get my money is, probably in my opinion, someone who ran for school board. Do I know this for a fact? No, I don't but what I can tell is writing style and tone. And no matter the moniker, it all looks and sounds the same. So former school board candidate, please grow up, get a life and run your own blog. The last caveat is that I do get that what I write can rile people. But the difference seems to be that some people are writing to rile others (or me) on purpose. This blog is for lively discussion of issues. Let's do the mature thing and keep it that way. I was out and about and missed the tweets but apparently, around noon-time, there was yet another shelter-in-place. Board Policy 1010, Board Oversight of Management, requires the School Board to conduct oversight work sessions. Among these, they are required to review Highly Capable Services at least once every three years. The last time they did an oversight meeting for advanced learning was about three years ago, on April 24, 2013, so it is time for another. The oversight meeting was scheduled for yesterday but it was deferred. That's fine. The District has cultivated a high degree of skepticism around these programs and has consistently failed to meet commitments made to this community. The common belief is that HCC has been diffused, that Spectrum has been dismantled, and that ALOs never really existed in the first place. The District has not been able to effectively disprove those beliefs and has, in fact, confirmed them to a disturbing degree. Here are some questions that the Board can ask when they finally get the opportunity. You may want to suggest some questions as well. Does Seattle Schools Have Money? I had planned to go to the Work Session today. As you may recall, it was to include Advanced Learning but that got pulled. The line-up of topics includes the Families & Education Levy which is the their first topic. Their presentation's page 8 is an interesting pie chart showing the different areas of education they fund and how much. I'd have to ask about the Early Learning and School Readiness portion and how much includes pre-K. Early Learning is generally defined at pre-K to 2nd or 3rd. I raise the issue because the City now has its own Pre-K levy so it would be good to know how that spending breaks out because of the new levy. Last summer, DEEL funded 12 summer programs serving more than 1,000 elementary and middle school students across18 sites. I don't know how many parents/citizens know that if the City wasn't funding summer school, there wouldn't be any. I wish there were more dollars for high school summer school for students who either need to catch up or want to get a requirement out of the way so they can take an elective during the school year. I'd love to see the documentation on what this looks like because that's a large and overarching kind of training for every single teacher in our district. We've seen from the City's Pre-K process that they have some interesting ideas about what "partnership" looks like. As well, I have been hearing about the Mayor's remarks during a race and equity discussion. He sure sounds like a guy getting ready to take over the district. There are plenty of things the city could address on race and equity - from the city side - without getting directly involved in running the district. This should be a Work Session all by itself because the presentation is very long and very involved. I have to wonder how directors will work in their own questions. I mean no disrespect - truly - but I find the presentation to be somewhat incoherent. For example, for Highly Capable, they only list APP schools with no mention of Spectrum BUT, just a couple of slides later, it's mentioned in passing with other programs that they lump together. I just don't know if it's worth it to go down there and sit thru it all. The last part of the Work Session is, once again, on Special Education. - By October 31, 2016, implement successfully 100% of the Special Education Memorandum of Understanding with OSPI requirements, including the recovery of IDEA Part B funding withheld. - the state is due to give back $3M withheld and this presentation reports that the NW and SW regions had their scheduled visits and received $500K each from that sum. - Slide 9 on principal feedback is heartening. I consistently hear from Sped parents that they are not seeing these changes for their own students. There is virtually nothing in the presentation about how the end-users - the parents - feel about all this activity. Hillary Clinton's event at Rainier Beach High was a bit odd. There were hundreds of people waiting outside when I got there about ten to six. (I was press so I got in early.) They had the event in the gym and had cordoned it off so much as to dilute the capacity by at least half. Then, they allowed people in so slowly - over the course of 2+ hours - that they didn't even fill it . There was room for at least 100 more people. But the crowd was enthused and certainly included a fair number of young people (which is somewhat contrary to whom she seems to gather in other areas of the country.) She did mentioned Rainier Beach and its IB program saying, "It makes me so proud to see what this school is doing with the IB program." I certainly think there is pride in the turnaround at RBHS but the fact that they have lost the principal who was the leader AND the district doesn't fully support the program financially makes those words ring a bit hollow. She also said she "wants to be a partner with principals and teachers and students." That was the extent of her talk about K-12 public education. She did speak about student debt and wondered out loud why interest rates on loans for housing are so low compared to those for student loans. She said she would work to refinance all student loans. During the time I had to wait for Secretary Clinton, I did see my state senator, Jamie Pedersen, and his family waiting to see her. Senator Pedersen and his husband, Eric, had their four young sons in tow (all SPS students) and we chatted about their experience. I'll have to write a separate thread about issues at Stevens Elementary but it was a mixed bag from them. 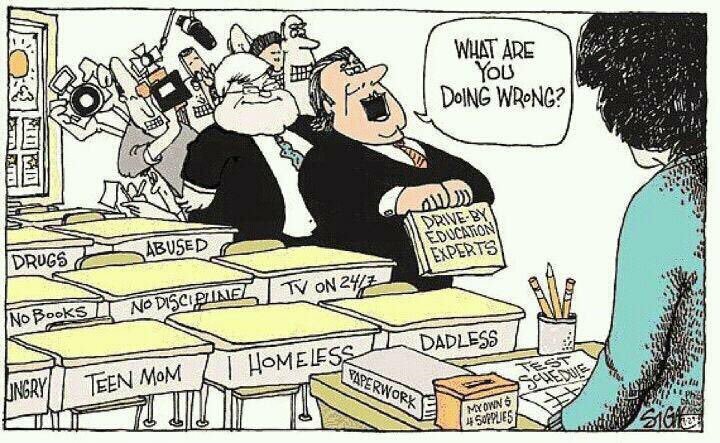 They certainly do like their teachers, though. I also heard on the radio that the legislature may just get finished by Friday. That means that all those bills piling up on the Governor's desk might see some action. He references the Times' two-part series on what Massachusetts does for public education and how their outcomes are better. He calls what is happening there "low-hanging fruit" but not to minimize what is happening but to point out the obvious - fully-funding schools as well as "preschool, more teacher training, more enrichment and special vocational classes." His suggestion? Shaming the legislature. I concur. Maybe this can be the turning point of sorts, a moment that some reporter will look back on 20 years from now, as one of ours just did for another state, as the period Washington finally got its collective act together about supporting and improving its schools. Barring that miracle, though, can we please just copy Massachusetts? Is the legislature "working?" Sure. Are they getting enough done to really justify that term? I'd say no (with some notable exceptions like Rep. Gerry Pollet.) And, are they getting their paramount duty done? Absolutely not and the next session is going to be one for the record-books in my judgment because they will finally - finally! - have to get McCleary done. Also, the Mayor is having people RSVP for his Education Summit on April 30th - no cost but I think it is to gauge turnout and childcare/interpretation services. Also to note, the City announced three more Seattle Schools will receive innovation grants for 2016-2017 via the Families and Education Levy - Muir Elementary, Leschi Elementary and Viewlands Elementary. The Fight the Fear Campaign, founded by musician Brandi Carlile in 2010, is excited to announce a Sexual Assault Awareness Evening for Western Washington High School Girls. This free event will take place on Thursday, April 28th from 7-9pm in Roosevelt High School's Performing Arts Center. Girls will learn to recognize the red flags that often precede assault, as well as the assertive communication, self-defense, de-escalation, and boundary setting skills that are a proven deterrent to violence. Guests will hear from survivors, including Jennifer Hopper, whose story is the subject of Eli Sanders’s new book While the City Slept. FTFC is a non-profit that teaches free self-defense and sexual assault awareness to Seattle-area youth. To get tickets for this free event, please visit our News/Events page at www.fightthefearcampaign.org<http://www.fightthefearcampaign.org/>. (Editor's note: the book, While the City Slept, is the harrowing account of an attack on Ms. Hopper and her girlfriend in their Seattle home. They were both raped and beaten and Ms. Hopper fled to get help and her girlfriend was murdered by their attacker. It is an important story and I don't know how far Ms. Hopper may get into it but I wanted to give readers a heads up. Update: letter from Knapp below. Oddly, he doesn't say who is interim president. Sources tell me that Jonathan Knapp resigned last week as the president of the SEA. He also stepped down from the King County Labor Council Board as well. I don't know why and I have not seen a notice about an interim head. I am being told there will likely be a special election in April to find a new leader. Concerns about traffic around Bailey-Gatzert makes the Capitol Hill Times. Surrounded by arterial streets and now First Hill streetcars, Bailey Gatzert Elementary can be a dangerous destination for students, a majority of which walk or bike to and from school daily. Luckily, it is high on the Seattle Department of Transportation’s list of priority schools in need of improvements. “It’s like an island surrounded by these really fast streets,” said Brian Dougherty, SDOT Safe Routes to School coordinator, who also attended the walkabout and offered suggestions for noted trouble spots. Several community groups plan to work with Bailey Gatzert parents, teachers and the principal to develop a plan for requesting funding to possibly study traffic issues in the neighborhood or make quick improvements, such as improved signage, striping at crosswalks and enhancing visibility. Dougherty told the Capitol Hill Times he will wait to receive Gyncild’s report from the meeting and then assess how SDOT can quickly make a number of traffic improvements on its end. Kudos to Ingraham High School's Improv Group, SHEILA, for their second win in a row at the Jet City Seattle Open. Update: this event is not sponsored by SPS; they are just renting the space to the campaign (or sponsor) of the event. Seattle Schools announced that presidential candidate, Hillary Clinton, will give a speech at Rainier Beach High on Tuesday night at 8:15 pm. Doors will open at 6:15 pm. The Board has been blindsided by a few program placement shenanigans (Middle College, EEU, Interagency, etc.) and got the idea of pulling back program placement authority from the Superintendent. That would be a shame because in the District's governance model, with its management/policy dichotomy, program placement is solidly on the management side and belongs among the Superintendent's tasks, not the Board's. That said, this same governance model expects the Superintendent to follow the Board's policy and, when it comes the program placement, Dr. Nyland has been an extremely naughty fellow with policy violations all across the horizon. So this becomes just another episode highlighting the district's fundamental governance flaw: the Board's only way to discipline the Superintendent is to fire him. No one is happy about how he has handled Program Placement, but no one is unhappy enough to fire him over it. Update: refusal form from SPS. SBAC testing has started! Ballard 11th graders taking Math SBAC tomorrow. Very little notice was given, I found out last night and opted my student out this morning. Here's the link to the Facebook page for Seattle Opt-Out. It is legal in Washington state to refuse testing for your child. The only time your child really needs to take the test is in 10th grade as a graduation requirement. Help Kids Understand "Unoriginal Work"
with wording that kids will easily get. A revised set of Superintendent's Procedures for policy 2109, Highly Capable Services and Advanced Learning Programs was presented to the Curriculum & Instruction policy committee on November 9, 2015. It bears review. Neighbor to Neighbor program and African American Male Scholars Think Tank to inform and get feedback from students, families, school staff and community stakeholders about the African American Male Scholars Initiative, to inform recommendations to the superintendent. This is the second in the series. Oversight Work Session- Teaching & Learning Part II (Curriculum & Instruction and Highly Capable), 5:30-7:00pm* this portion has been postponed to a date to be determined. New topic to be determined. Editor's note: Put off discussion of Highly Capable, again? I'm hoping this is because directors have asked hard questions about this program. Not one, not two, not three but four director community meetings. Again, I wish they could try to space these out. So sorry but apparently there are just people in this world that have nothing better to do than troll blogs. It's sad, it's pathetic but there you are. So I have turned back on comment moderation. I am, by no stretch of the imagination, a celebrity. I do, however, write for a reasonably well-read online publication almost every day, and put my name to my opinions both here and on a handful of other platforms where basically anyone can offer unsolicited feedback with a few strokes of a keyboard. I’ve had people call me awful names. I’ve had people condescendingly explain things to me that I already knew. I’ve had friends, family, and loved ones in more private-facing lines of work express horror at things that, for me, are just a minor drawback of my job. And I’ve known that a good chunk of all this wouldn’t be happening if my name were Alexander and not Alison. I'll be honest - some of that rang true to me. When I read other public education blogs, I do notice a difference in comments when the writers are women vs those whose writers are men. I don't know if this is a real issue at this blog but sometimes if feels like it. Can we just discuss education issues of the day and not make it personal? That's actually what this blog is for. For example, last year Seattle’s Franklin High School ranked sixth among all high schools for sending graduates to the UW, which I imagine is a point of pride for Principal Jennifer Wiley, who herself earned two UW degrees. Her students have faced challenges throughout their lives, with 70 percent qualifying for free or reduced-price lunches and an unknown number having faced discrimination, whether because of their race, their nationality or their language. As someone who knows from personal experience how access to education can change a life, I’m thrilled that we’ll be welcoming students like those from Franklin and beyond who are eager to learn with you. Let's see - positive academic outcomes for low-income students of color? I guess it isn't just for charter schools. Under Mia's leadership, Aki Kurose has consistently been one of the highest growth schools in the entire district. Year after year, students at Aki have shown some of the strongest annual academic growth. Mia recently spent time at the White House after being one of the few principals across the nation, invited by the Johns Hopkins University's Everyone Graduates Center. I have previously pointed out the obvious about Governor Jay Inslee and the situation he is in regarding the charter school bill on his desk. 1) He ran on the Washington State Democratic platform which is against charter schools. 3) Throughout his tenure, he has said he's against charter schools. He has never said anything publicly about that stance changing. 4) During the legislature session, he did go visit a charter and said he was glad to meet students who loved reading. Some interpreted that as a soften of his stance. I'm not sure one visit to a charter school would change anyone's mind. He has three choices: approve, veto or wait 20 days and then it just passes into law. He'll let it pass into law. He'll say, "I personally don't support charters but the legislature went thru the process and I want to "save" these schools." Then he can say he didn't approve it AND he didn't veto it. That would be a rather wan outcome. He lets it pass into law BUT then asks for an expedited hearing from some court on the law's constitutionality. I would consider that fair because it gives something to both sides. The charter schools would have their law but that law is going to be gone thru by a judge to make sure that we aren't all sitting here next year at the same time with even MORE families affected by an overturn charter law. Of course, my favored outcome is a veto which would make me admire the Governor for remaining constant to a stand he ran on and an acknowledgement that this is a deeply flawed and rushed bill that will not withstand a legal challenge. What is generally unknown by parents, and far more egregious than the data release requested in the Morgan Hill lawsuit, are similar data-mining requirements by federally and state-authorized Common Core programs. Parents want their children to learn academic material without the psychological conditioning, data mining, tracking and analyzing of behavioral patterns. These federal and state programs exclude local control of education, and the federal government reference to gathering of students’ personal information is too Orwellian and rightfully creates anxiety and worry for parents. That last paragraph brings up a good question - has public education gone too "deep dive" on kids and how they learn? Because the authors are suggesting just that. One of the more interesting trends in corporate ed reform thinking is that parents are just "confused" and probably don't know what they are talking about when it comes to Common Core as well as opting out. An elementary school principal in Brooklyn apparently went overboard in her zeal to prevent students from opting out. After finding a fifth-grader handing out opt-out fliers at her Williamsburg elementary school this week, a principal confiscated the materials, pulled the student into her office and then hastily convened a meeting for students, parents told DNAinfo New York. Principal Sereida Rodriguez-Guerra of P.S. 84 chastised the fifth-grader, sending the student into tears, before telling an auditorium full of third- through fifth-graders, “You’ve got to get this opt-out stuff out of your head,” according to multiple parents of students pulled into the impromptu tirade against refusing to take next month's state English and math tests. Rodriguez-Guerra went on to lecture the students about the controversial opt-out movement, telling them not to believe what their parents tell them and that the state exams given to third- to-eighth-graders were good for them and would make them smarter, parents said. The principal also refused a PTA forum to discuss testing, telling the parents to get a permit. This at a high-performing school. So What Is Massachusetts doing that Washington State Isn't? The article points out that Washington students don’t take the international exams but doesn’t say why. Could that be cost? I'll have to call OSPI and ask. “The education of all children (in Massachusetts) was seen as a matter, not only of fairness but of economic self-interest,” said Paul Reville, who was the state’s secretary of education during the overhaul and now teaches at Harvard University. In February of this year, police went to Summit Tahoma High School (part of the Summit charter school chain) in San Jose, California, on a tip from a parent that there was a sexual relationship going on between a student and a teacher. One of the hottest stories out recently is about a study from UCLA's The Civil Rights Project. This is what those researchers found. Executive SummaryIn 2011-12, every one of the nation’s 95,000 schools was required to report its school discipline data, including charter schools. This report, along with the companion spreadsheet, provides the first comprehensive description of the use of suspensions by charter schools. This report, which covers more than 5,250 charter schools, focuses on out-of-school suspension rates at the elementary and secondary levels. It specifically examines the extent to which charter schools suspend children of color and children with disabilities at excessive and disparate rates. Wood shop, they explained, is the last shop class at Sealth. Teacher Nan Johnson is an inspiration, they told us, mentoring students, giving them the chance to express their creativity while mastering real-world skills during the wood-shop work – calculating measurements, using tools, overseeing projects. All of the students who spoke with us said it would be a mistake to remove this class from the curriculum – and remember, they’re seniors, so they’re campaigning on behalf of students coming up behind their class. They also have an online campaign going, with almost 200 names and a space for community comments – find it here. The final decision is expected next Wednesday; we’ll be following up. The Times is reporting some local doctors have their own (controversial) plan for vaccinations. Namely, they pick the one disease that they think is the most worrisome (to woo anti-vaxxers) and say that should be good enough. That disease would be measles. I can only say that I recall there have been several serious outbreaks of whooping cough across the nation. As well, until polio is truly eradicated off the face of the earth, the polio vaccination is vital. Friday memos to the Board are always interesting. Here you will find all sorts of interesting stuff. "District achievement testing in reading and math (MAP or SBA) is required to determine Advanced Learning eligibility. Candidates are required to participate in district achievement testing. Opting out of testing is a decision to opt out of the Advanced Learning eligibility testing process." So there we have it: Students who are opted out of SBAC are ineligible for Advanced Learning. This is great news from Senator Murray's office. (Washington, D.C.) – Today, Senator Patty Murray (D-WA), the top Democrat on the Senate Health, Education, Labor, and Pensions (HELP) Committee, introduced the Women and Minorities in STEM Booster Act, legislation that would provide support to increase the number of women and minorities entering STEM (science, technology, engineering, and math) fields. This bill would authorize the National Science Foundation to award competitive grants for outreach, mentoring, and professional development programs that support the recruitment and retention of women and minorities in STEM fields. The legislation also authorizes funding for STEM education outreach programs at the elementary and secondary school level in order to strengthen and diversify the pipeline of future STEM professionals. “If we’re going to truly empower young women to compete in the 21st century economy, it’s crucial that we have the federal commitments necessary to support their recruitment and retention in the STEM fields,” said Senator Murray. The Women and Minorities in STEM Booster Act is supported by the American Association of University Women; Association of Women’s Business Centers; Association of Women in Science; Girl Scouts of the USA; Girls, Inc.; National Action Council for Minority Engineers; National Council of Asian Pacific Americans; National Society for Black Engineers; Society for Advancement of Chicanos/Hispanics and Native Americans in Science; Southeast Asia Resource Action Center; Society of Women Engineers; STEMConnector/Million Women Mentors; and Women in Public Policy. The legislation is co-sponsored by Senator Mazie K. Hirono (D-HI), Tammy Baldwin (D-WI), Sherrod Brown (D-OH), Dianne Feinstein (D-CA), Kirsten Gillibrand (D-NY), Martin Henrich (D-NM), and Debbie Stabenow (D-MI), and Representatives Madeline Z. Bordallo (D-GU), Matt Cartwright (D-PA), Judy Chu (D-CA), Katherine Clark (D-MA), Mark DeSaulnier (D-CA), Donna Edwards (D-MD), Chaka Fattah (D-PA), Bill Foster (D-IL), Ruben Gallego (D-AZ), Luis Gutiérrez (D-IL), Alcee L. Hastings (D-FL), Eleanor Holmes Norton (D-DC), Mike Honda (D-CA), Sheila Jackson Lee (D-TX), William R. Keating (D-MA), James R. Langevin (D-RI), Rick Larsen (D-WA), Ann McLane Kuster (D-NH), Bill Pascrell (D-NJ), Charles B. Rangel (D-NY), C.A. Dutch Ruppersberger (D-MD), Tim Ryan (D-OH), Louise Slaughter (D-NY), Mark Takano (D-CA), and Frederica Wilson (D-FL). Click HERE for text of the Women and Minorities in STEM Booster Act. As the McCleary Crime Scene-Special Session says: if the legislature can opt-out of fully funding schools, why can't parents opt-out of the state test? A good reason to boycott the SBAC this year. Guess who wants a new job? Facilities head Flip Herndon. Cue the Times to get upset that senior management is shifting again. The School Board will interview six semi-finalist candidates this Saturday, March 19, at Edmonds Woodway High School, Great Hall, from 8:30 a.m. to 3:00 p.m. We are starting at 8:30 a.m., instead of 9:00 a.m. as previously noted. The meeting is open to the public and observers will be able to provide written feedback. After the initial round of interviews, the candidate field will be narrowed to three. The finalists will be in the District March 28, 29, and 30 … one candidate each day, where they will have the opportunity to tour schools and meet with staff and administrators. There will be a Community Public Forum to meet the three finalists on March 31 from 6:30 to 8:30 p.m. at Mountlake Terrace High School Theater. Community members will have an opportunity to ask questions and complete feedback forms to share with the School Board. If you are unable to join us at a Forum, it will be streamed live. Please visit www.edmonds.wednet.edu/ESDlive on the actual date, March 31, to view. Interesting that Edmonds allows the public to come listen in to the interviews with individual candidates. Update: Director Peters has offered a second amendment to get rid of the 25% holdback. I note that one speaker in public testimony reiterated the City's claim that the benchmarks that the holdback is based on are easy to meet and that even if the district didn't meet all of them, "the district has a reserve and could get the funds there." Obviously this gentleman does not understand how state funding for K-12 works but I don't believe that the district can use those common school funds for this purpose. As well, I would think that most Seattle Schools' parents could think of many K-12 schools that need the funding from the Reserve Fund. In advance of the vote on the continuation/expansion of the City's pre-K program, KUOW had this timely story from reporter Ann Dornfeld. But we face a big, little climb here, because this coming September we have to expand to 39 classrooms and almost 800 kids being served," Burgess said. The program is scheduled to ramp up annually, with a goal of 70 classrooms in 2017, and 100 in 2018 to serve a final count of 2,000 students. The City still needs to find a dozen more classrooms just to stay on track for this fall. Some classrooms the city does have its eye on are in Seattle Public Schools. The preschool program is already in three elementary schools – and Burgess says there is potential for huge growth. "Nearly every elementary school in Seattle has a preschool program or some form of child care today," Burgess said. "So, working with the city, we’re hoping the district will, over time, convert those existing classrooms that are being used for preschool or child care to be part of the Seattle Preschool Program." So parents, the City is not just going after a couple of childcare spaces - they want ALL of them. I'm sure there are good arguments on both sides if whether pre-K is more important or if on-site childcare is more important. As governmental entities looking at academic outcomes, the City and the district might say pre-K. I think many parents might say childcare is more important. Depending on how you feel, you might want to consider getting your PTA involved as well as advocacy to the Board. Back to the Board action, as I previously mentioned in a separate thread, staff decided to roll both issues into one BAR (likely by design) so it is all or nothing for the Board. Luckily, Directors Harris and Geary wrote a great amendment that will protect the district's funds AND, hopefully, compel the City to follow the fed regulations that the district has to in serving pre-K Special Education students. Two adult male suspects are in jail thanks to a quick response by Gang Unit Detectives Jones and Pinkerton, who were patrolling the neighborhood when the shooting occurred. It appears that the victim and the suspect actually exchanged gunfire, with the victim suffering the gunshot wound to the hand. A RBHS mom spoke out - not in public testimony but during the meeting - about her worry for her child with the number of shots fired in this neighborhood. She was directed to Pegi McEvoy for more info. It is interesting that the City wants to "help" SPS and yet the one thing in their power and that is THEIR responsibility - the safety of the areas around the schools - they don't seem to be able to do much. The district has a plan to expand the system of dual language/international schools. I think this would be welcome news to many parents who would like that opportunity for their child. Seattle Public Schools in March 2016 initiated a process for addressing these challenges and others through the establishment of an International Schools / Dual Language Immersion Task Force. The primary purpose of the Task Force is to prepare a report to the Superintendent of Schools regarding the impacts, risks and benefits for sustaining and expanding Seattle’s International Schools and Dual Language Immersion programs. The Superintendent will use this report, along with other important data in making recommendations to the School Board for potential changes in the 2017-18 school year. However, there is always the underlying issue of how this is funded. The district likes to start programs with little funding and then expect them to do well (or expect parents to raise money for them to do well.) So I am wary of this effort even as I applaud it. A very wonderful letter from a mom with a special needs child after "social skills" training in her child's school that forgot that there are many types of people in the world that we should all be kind to and show respect for. In case you didn't know, as of Feb. 2, 2016, OSPI reports that there are 35, 511 homeless students in Washington State. That's 3.3% of the P-12 population. It's an over 9% increase from 2013-2014 and a 62.7% increase from 2009-2010. The student was reportedly walking in the 2100 block of SW Thistle St around 7:30 AM when two teenage boys approached him. One suspect brandished a knife, demanded money from the victim, and forced him to empty out his backpack. Both suspects then fled with the student’s cell phone. The student ran to school and contacted staff, who called 911. Here's something the City can do if it wants to help with public education. This is just one of numerous incidents for students at Denny and Chief Sealth. You have to wonder how parents are feeling. OSPI released new data about the 2015 high school graduation rates in Washington state. Here's the presentation. Over at the Community Forum for HCC (APP) in Seattle Schools, there are some concerned parents asking questions about capacity in the building. I'll preface that Hamilton is a bit of an anomaly for middle schools. It has a fairly small footprint and even a renovation didn't add that much more capacity. It always seemed to be apparent that there would not be much breathing room in the building. The Times is looking for personal stories about how your school may be struggling with lack of funding and how parents are trying to backfill some of those resources with PTA/PTP fund-raising. They like the stories by Wednesday, the 16th so please fill out this form and let them hear from you. How does the debate over education funding affect your experience in school? How would you make science fun for kids? I mentioned - weeks ago - that I had wanted to do a round-up of charter schools and their outcomes in this country. I am always amused when people say there's just a "handful" of stories being blown up. Just not true. I don't know how anyone missed this one - a 1st grader in a big-chain charter school in NYC getting bullied by her teacher. Before the teacher says anything, you should look at the posture and body language of those students. It's caught on video by another teacher who was very concerned for this class. Horrific. The mother of was beyond upset and yet felt marginalized and ignored by the head of the charter system. She pulled her daughter out. McGilvra Elem. canceled today due to power outage. Students already dropped off to be supervised till end of day. Evening event canceled. I knew McGilvra had been closed until 11:30 am because of the power outage but I guess it could not be fixed. Today is the C&I meeting which I reported on in Seattle Schools This Week. Somehow I missed that it's two meetings. The first one, starting at 4:30 pm is the regular C&I meeting and the other, starting at 6 pm, is a Committee Meeting of the Whole. Why is the Committee Meeting of the Whole happening? Because they are going to discuss Policy A01.00, Instructional Philosophy, which is a huge policy for teaching and learning for the district. Second in a series - several questions came from readers. I hope to put together at least one debate. First in a series - several questions came from readers. I hope to put together at least one debate. Update: from the tell-it-like-it-is pages of The Stranger, their view on the current charter school situation in Washington State. The Governor sounded more annoyed than upset at last night's press conference. Basically, he asked why the legislature couldn't get its most basic duty done which was to produce the session's Supplemental Budget. 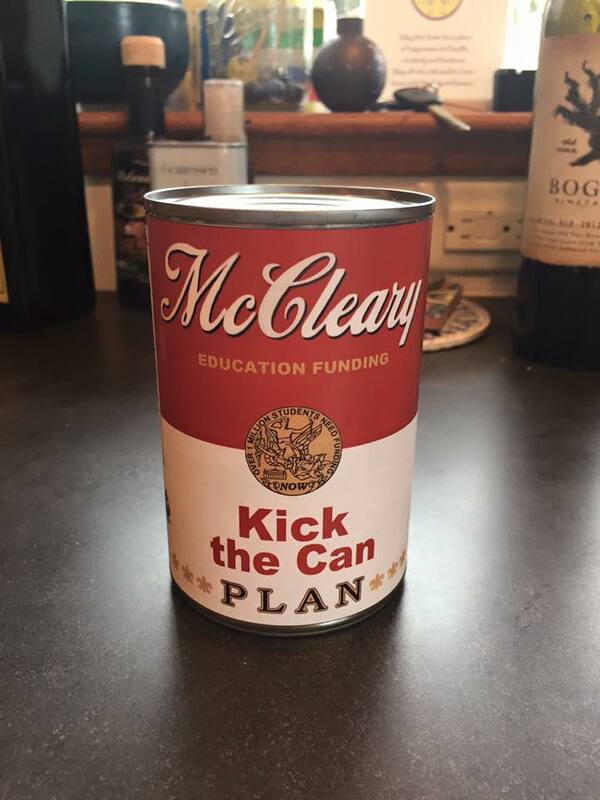 Sure, they had hours of time to discuss charter schools and transgendered restrooms but fully-funding schools via the McCleary decision? Nah. The budget? Ditto. So the Governor held true to his word when he said no budget and he would be vetoing bills and he vetoed 27 bills and signed 10 (most of them about public safety.) None of them were the charter school bill which got to his desk late. The legislation can override each veto with 2/3 vote. Or legislature can reintroduce each bill. Bills sent to governor's desk within past five days are not up for action yet. He can sit on those for a bit or veto. I note that the Governor has a third choice on bills which is to do nothing and they then pass into law. Also, for bills not delivered to him five days before the session ends, he has 20 days in which he can act. That includes the charter school bill. My belief is that he will sit down and carefully consider what it all might look like to voters and especially members of the Democratic party that he belongs to and who got him elected. As well, there is the Democratic platform that he got elected from as well the the state constitution that he swore to uphold. That would be a lot to turn his back on. - The Governor has said that his "stance has not changed." If he means his charter school stance that he ran on and stated throughout his term, that would be that he is against charter schools. To change that stance and NOT tell voters until he signs a charter school law would be pretty appalling. -Students at former charter schools DO have someplace to go next fall. There is a place for each and every one of them at traditional public schools. I appreciate that they and their parents don't want that but I believe in the constitution more than I believe in choice. It's the backbone of our society and our state/nation and probably one of the most important things that students can learn in school. Most of those schools would not have opened had charter supporters filed a "expedited ruling" with the Supreme Court. They did not. All this anguish for these students and families could have been avoided or blunted had the moneyed charter supporters cared enough to protect them. The families of the students are blameless but I believe they were props and a means to an end for the heavy-hitters for charter support in this state. - The Governor stated that he likes "innovation" but I don't see a lot of true innovation at most of the charters. I think they focus in a different manner than many traditional schools (and I believe that is more because they can control their size than what they do.) But is that innovation? I don't believe it is. - The bill is not an "elegant" one - it's a mash-up so flawed its own sponsor had to put up two amendments because he couldn't even it read it properly. (And one amendment was about appropriations for charter schools!) The Governor should not sign a bill that was rushed and is terribly flawed. - There is the very distinct possibility of going back into court over this mess of a bill - with possibly even MORE schools and MORE families affected - makes signing this bill into law the wrong choice. Governor, vote your conscience AND the constitution. If you do so, then your choice is clear. Veto the charter school bill. I'll have a separate thread but the Governor called a special session because the legislature didn't get its primary job - a supplemental budget - done. They took hours to argue for charter schools and against transgendered restrooms but couldn't get progress on McCleary nor get the budget done. As I always say - priorities, kids. (The Governor vetoed more than 20 bills and signed 10 bills but the charter bill was not among them. Since that bill was delivered at about the last minute, he has 20 days to sign it, veto it or allow it to pass into law without his signature. Info on upcoming Democratic presidential caucuses here. Family Survey Coming Soon – Update your email address and contact info now! The annual Seattle Public School Family Survey is scheduled to be distributed next month, and we encourage you to contact your child’s school to ensure your email address and contact information is up to date by March 18. 2) Also, the heart that the kids and staff at Greenwood Elementary created yesterday made the national news on NBC. As well, the Mayor dropped by the school to offer his thanks to the school for their support of their community after the Greenwood explosion. Washington State Dems have one thing that we don't like to talk about - that's the state of public education. It is a schism within the party that everyone knows about, snipes about but no one seems to want to find a way forward. On one side you have the big money people - League of Education Voters, Stand for Children, Washington State Charter Schools Association, DFER Washington, CRPE - all fixated on charter schools. And strangely silent on full funding for our schools. What is means is that Governor Inslee may be in a very tight spot in a day or so. He has consistently been against charter schools and yet, been quite coy lately on his stand. It could come back to haunt him in this election year. On the other side, today I see there are the following groups lining up against the charter legislation. Greenwood Ave N will remain closed until further notice from N 83rd St to N 87th St. N 85th St also closed from Dayton to 1st. "68 tweets tagging me to support charter schools. Not one of them calls for fully funding our public schools. Sad!" Yes, that is sad but not surprising. What's really sad? That if the charter bill passes, the charter schools WILL reap the benefits of McCleary when it's fully enacted and they didn't publicly lift a finger. Not one school, not WSCSA. I did forget one key thing. From the get go, the former charter schools wanted reimbursement from the State from their costs, from Sep. 4, 2015, to run their schools if a new charter law came thru. I found this fairly interesting given that the Court ruled the law unconstitutional and just because the legislature could find a financial fix, it didn't seem to me that the State owed them money. I cannot tell if this is still valid in this bill. The Republican House/Senate Majority Caucus had a press conference to discuss various subjects on the docket as the end of the legislative session draws near. At about 2:30, Rep Chad Magendanz weighs in on charter legislation. Want to serve on a HALA Community Focus Group? We are looking for community members to serve on our community focus groups that will guide the implementation of HALA. Learn more and complete our application today! Deadline is Friday February 26 for the general public, and Friday March 11 for non-English speakers. Email us at HALAapplication@Seattle.gov for more information. Community Focus Group Applications available in translated languages. Due to the delayed release of translated Community Focus Group applications, the deadline is extended to Friday March 11 for non-English speakers. Application forms now reflect the March 11 due date. Good story from NPR about a little girl who wanted to see more kids who looked like her. Fewer than 10 percent of children's books released in 2015 had a black person as the main character, according to a yearly analysis by the Cooperative Children's Book Center at the University of Wisconsin, Madison. And while the number of children's books about minorities has increased in the past 20 years, many classroom libraries have older books. Last fall, Marley decided to do something about it. She set a goal of collecting 1,000 books about black girls by the beginning of February, and #1000blackgirlbooks was born. Countdown for Legislative Session - How Will It End? Gov. Jay Inslee said Monday that he will not sign any bills coming his way if legislators in Olympia do not finish the budget on time. "This morning I let leadership know that they should not expect me to sign bills until they reach a budget agreement," Inslee said. "Doing a budget is their first job. They need to do their first job," he said. "Then, and only then, can we start to look at these bills that are not going to be signed unless we get a budget." Three different operations of the district will be discussed. Seattle City Club is having a Town Hall event - Seattle Speaks: Making the Grade - to talk about Seattle School district. As the State Legislature defers fully funding public education for yet another year, what are the implications for the Seattle school district? The first City of Seattle Education Summit in 25 years will happen this spring, and there’s a lot to discuss: an overcrowded district, the achievement gap, discipline inequity, new programs and decaying buildings. Are we on the right path to funding and providing a quality education for our students? How can we improve graduation rates? What can the community do to ensure students are prepared to succeed? Join host Brian Callanan for a town hall discussion on our live, interactive show Seattle Speaks. Presented in partnership with Seattle CityClub, Town Hall and Seattle Channel. In advance of the Mayor's so-called "Education Summit" (April 30th at Garfield Community Center), the Mayor is having a series of "community conversations." School vaccination regulations in Washington state have changed for the upcoming 2016-17 school year. The Washington State Department of Health now requires two doses of chickenpox (Varicella) vaccine for all students in grades K through 12. Students who do not have two doses of vaccine by the start of classes in September, 2016, could be excluded from school. West Seattle Meaningful Movies – Education Inc. For Profit. For Kids? As public schools across the country struggle for funding, some people seek to turn them over to large education corporations and private investors. Through the eyes of a parent, Education, Inc. examines the free-market, for-profit interests that are quietly and systematically privatizing U.S. public education, under the banner of “school choice.” The film includes school protests, raucous school board meetings, and interviews with some of the best-known educators in the country. Produced by Brian Malone, 2015. Run time 53 minutes. NO CHARGE - but donations gratefully received. Help us minimize waste - bring your own mug.